U.S. Air Force and the Michigan Air National Guard. Eric focuses primarily on patent and trademark prosecution. He also handles patent and copyright licensing matters as well as patent, trademark, and trade secret litigation. Board of Directors, Reising Ethington P.C. Management Committee Member, Reising Ethington P.C. Lecturer on international IP enforcement at Southern Methodist University Lyle School of Engineering, May 2018. Reising recently negotiated a settlement in a patent and trademark infringement case in the medical industry. 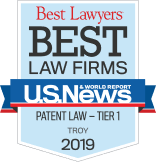 Both the Detroit Legal News and Intellectual Property Today published Eric Jones article titled The Obvious Advantage - Revisited. Eric has expertise born from a lifetime around groundbreaking technology. He began his career designing thermal imaging systems at Texas Instruments, then left TI to serve as a pilot in the U.S. Air Force and the Michigan Air National Guard. He piloted fighter and trainer aircraft and provided platform instruction in jet engine technology, avionics, aeronautics, navigation, flight controls, and weapon systems. He most recently served as mission commander and flight commander in an F-16 fighter squadron. Eric focuses primarily on patent and trademark prosecution. He also handles patent and copyright licensing matters as well as patent, trademark, and trade secret litigation. Eric has received an AV Preeminent® rating from the attorney directory Martindale-Hubbell. His clientele ranges from one of the world’s largest defense contractors to a startup medical device company that has created a revolutionary noninvasive system for remediating centralized pain issues through neuromodulation.